Bay Food Brokerage is dedicated to providing clients and customers with quality support, unparalled service and impactful sales insight to promote growth in the retail food industry. What's the Advantage of Bay Food Brokerage? The foundation to any business is satisfied customers. Bay Food Brokerage offers manufacturers the commitment to develop and maintain a long standing relationship to achieve mutual success. One of the most important advantages in hiring Bay Food Brokerage is the fact that we maintain our focus on the Perishable departments of the retailer. Unlike traditional grocery brokers this focus allows Bay Food Brokerage to maintain a very strong dedication to these departments. Becoming the leader in our industry was not an easy task. 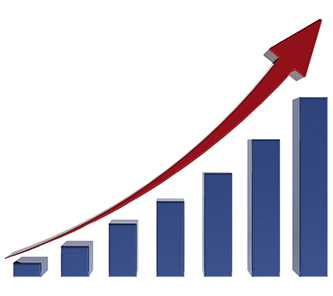 Through our continual management and training we are able to monitor the performance and productivity of each employee in effort to surpass customer expectations. Although our industry is ever changing, it is our desire to know and understand our manufacturers and the needs of their business. We develop specialized problem solving techniques and sales strategies. Our sales representatives and service teams aggressively develop specialized problem solving techniques and sales strategies. This is done through knowledge and education of the industry and our manufacturers. These tactics enable Bay Food Brokerage to stay in the forefront of market trends. When we combine these processes with the latest technology it gives our manufacturers a major advantage over their competitors. Being in command and having our full attention focused on the perishable departments allows us to be aggressive in overcoming the challenges of our manufacturers. 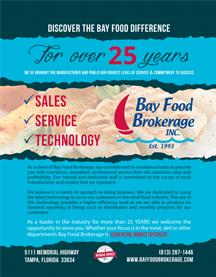 We consider Bay Food Brokerage to be an extension of each of our clients that we represent. We have a vested interest in the success of each of our manufacturers. Bay Food Brokerage was founded on the core values and beliefs of hard work, determination and customer satisfaction. We've been a leader in the food brokerage industry for over 25 years.